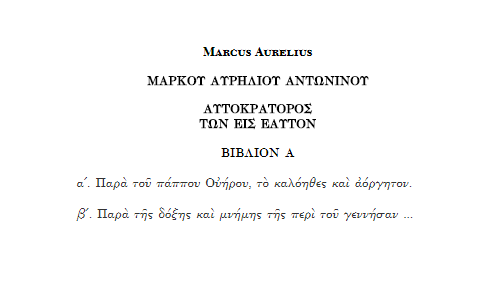 Today kicks off Michel Daw’s project of the reading of Marcus’ Meditations. You can find the pdf of the plan here. Book I is an exercise in gratitude. Marcus thanks and gives credit to those who helped shaped the man he has become. I begins first with family, noting their specific contribution to his rearing and formation. He moves on to teachers and philosophers, who helped inculcate in him early that philosophy is thing to do, a way of life, and not merely analytical and rhetorical exercise. I will begin this reading of Meditations with a Book I of my own. To my grandfather and father I owe the appreciation of the example of hard work and the meaning of family ties. These men set an example in this arena which I have never met, but which was so great that even when I see myself fall short, I stand out among my colleagues and coworkers. Also to my grandfather, the love of music and stories. To my mother I owe the belief that life must be meaningful, that the all-too-common settling for the average is a danger to be avoided. To her I also attribute the structure of my understanding of things divine; as well as my love of reading, writing, and great literature. Two teachers of mine stand out in memory from my formative years: Dr. Seitz and Mr. Fields. These two provided me with the example of excellent instructors, passionate orators, and genuinely caring men. In an environment which is not overly conducive to such things, these two changed my perspective on more than just lecture material. Two more recent teachers who have helped to shape my efforts in philosophy, carefully correcting errors and misapprehensions but also knowing when to step back and let me solve a problem or grow in my time: Erik Wiegardt and Chris Fisher. To Yannos, Brendan, Germano and Chaz for always being willing soundboards, mutual advisers, friends, and teachers. To several close friends: for supporting me and helping me rebuild when I myself could not see a way out of the ruins and ashes of my external endeavors. ← Musonius-esque living, Cynicism, Hercules, and the Pseudo-Lucian.